Growing brands choose BigCommerce and save up to $20,000 per year with built in features and no transaction fees. 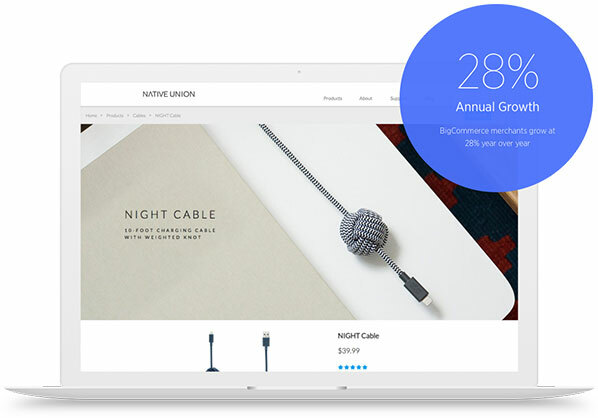 Why Do Growing Online Brands Prefer BigCommerce? Built-in features vs. apps: BigCommerce doesn't require a reliance on third-party applications to address the core functionality required by growing businesses. Growth without limits: BigCommerce merchants don’t have to worry about hitting a ceiling in platform capabilities — reducing the potential risk of being forced to migrate to a scalable ecommerce platform down the road. Still, it’s important to recognize where this service struggles. While they have plenty of professional templates to choose from, some of those templates are not fully responsive - meaning they may not display properly on mobile devices with smaller screens. Businesses of all sizes can benefit from the organic traffic that comes with having a well-optimized website. There are several factors such as URL structure, site speed, page titles and sitewide HTTPs that can impact how well a store functions. BigCommerce default URLs (products, categories and webpages) use a best-in-class format and are fully customizable to help improve search rankings. For many merchants, the ability to set the default URL structure for products and categories on the store level and still modify individual products and categories. Additionally, BigCommerce offers a wide range of Google AMP (accelerated mobile pages) enabled themes which allow merchants to provide lightning fast product and category pages on mobile devices. Fortunately, BigCommerce put just as much effort into its security as it does into its website design. When it comes to uptime, BigCommerce boasts a 99.99% average uptime (compared to the industry average of 99.5%). Historically, it has managed to deliver 100% availability during Cyber Week. With each store protected by layers of perimeter and server-specific firewalls, file integrity scanners and intrusion detection software, it’s clear that BigCommerce cares about keeping your data safe as much as you do. BigCommerce merchants don’t have to worry about paying for another app or creating multiple products to troubleshoot these types of limitations, with support for up to 600 variants (ie: an option or combination of options tied to a SKU) and/or up to 250 values in a single option (for products without a SKU or inventory additional options can be supported). Merchants can also display their options in a wide range of styles including native support for drop down menus, radio buttons, checkbox options, swatch options, text/number fields, date fields, files uploaded and product pick lists (for upselling another product). At a quick glance, BigCommerce and Shopify's plans can look fairly similar. Once you examine the cost of 3rd part apps, it's easy to understand why store owners choose BigCommerce. Both BigCommerce and Shopify include the fundamental features needed to run an online store, such as easy-to-use tools to build and manage your store, site hosting and 24/7 tech support with chat, ticket and phone included. Unlike other SaaS ecommerce platforms in the market, both BigCommerce and Shopify also include unlimited bandwidth, free SSL certificates, unlimited product listings, an active Community, native blog functionality and access to import/export with ease. While BigCommerce and Shopify have some similar features, the out-of-the-box functionality of BigCommerce can save business owners roughly $6,000 - $20,000 per year in app subscription costs, compared to Shopify. To get these same features out-of-the-box, Shopify merchants would need to install roughly 35+ additional apps, costing up to $20,000 a year.